Joseph Mallozzi's Weblog: January 12, 2011: Stargate Production Update! January 12, 2011: Stargate Production Update! Hey, you know who’s a big fan of our show? 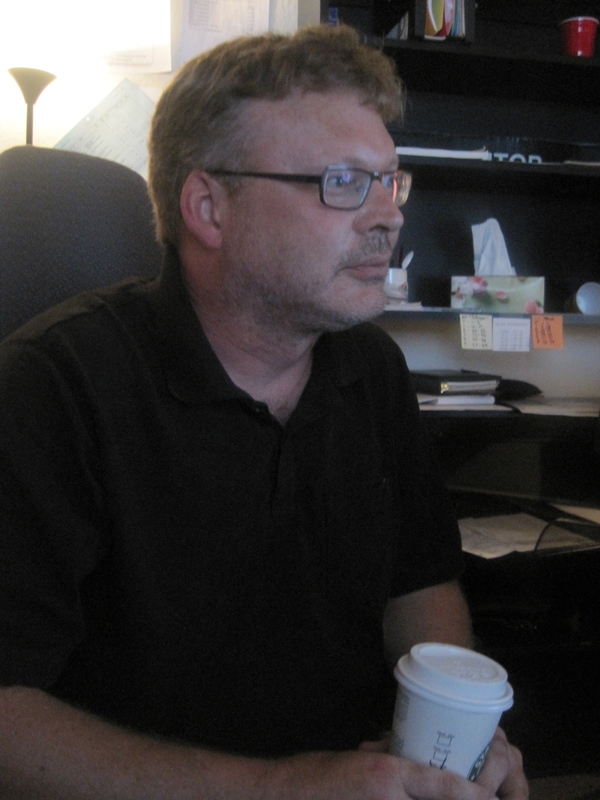 Mark Savela, our Visual Effects Supervisor. I know, I know. I imagine most everyone who worked on the franchise not only enjoyed what they did, but liked the series they contributed to as well. But there’s a difference between liking a show and being a fan of the show. There’s a certain passion, dare I say love, that accompanies the latter. And that’s what I sense from Mark whenever he comes in to discuss concept work, temps, finished visual effects, or how freakin’ awesome the show looked in HD when it aired the other night. He’s a guy who loves what he does because he loves Stargate, and this always comes through in his ever-positive attitude and the high quality of his work. Visual Effects Supervisor Mark Savela at work. Anyway, Mark swung by my office yesterday morning to show me, among other things, an early version of the creature cam/pov for my episode, The Hunt. Mark was suggesting desaturating it a little to give it a more alien feel, but I kind of like the sharpness of the colors and the rainbowing effect on the edges of the tunnel vision. I was in the office yesterday to watch the Day 1 Mix of The Hunt. Great stuff! Anyway, while there, I talked to Brad. Needless to say, he’s been working hard to ensure we all get the opportunity to work with Mark in 2011. Nothing definite as of yet to report but a minor hurdle was cleared. Quite a few hurdles still lie ahead and there’s always the chance it might all be for naught – but right now, things are looking positive. Previous Article January 11, 2011: The Top 10 Food T.V. Personalities I Want To Love But Don’t/Want To Hate But Can’t! Next Article January 13, 2011: The Chairman touches base! Jelly on the move! Lunch at Romer’s Burger Bar! Dinner at Peckinpah! And &$%#ing Shaw Cable keeps &$@#$ing calling me and getting on my &%$@ing nerves! Gosh.. im so excited now! Fingers crossed for more SGA, SGU, and SG-1!! I think I love you. You’ve just made my day. Hope is hope. I’ll take it. Tell Brad we love him too! Glad to hear that there is a possibility that things may continue in some way shape or form. I hope the good news continues and you will have more details for us in the coming days and weeks. On to the matter of you list this past week: No Adam Richman? Admit it: he can be a little overbearing on MvF but let’s face it. Seeing him in pain on spicy challenges is a guilty pleasure of mine. Also, No references to Bizarre Foods on the Travel Channel? By the way: How has Jelly been doing since you got home? Hope all is well. By the way… Soon, I will finally be able to take your advice and ditch this blackberry in favor of the Verizon Iphone. Can’t wait!!! “Anyway, while there, I talked to Brad. Needless to say, he’s been working hard to ensure we all get the opportunity to work with Mark in 2011. Nothing definite as of yet to report but a minor hurdle was cleared. Quite a few hurdles still lie ahead and there’s always the chance it might all be for naught – but right now, things are looking positive. Would you please clarify for us: Are you referring to the possible continuation of Stargate Universe? Or one of the Stargate movies, or a completely new project? Or all of the above? I’m excited that the “news” is positive not sure what this means but will keep my eyes glued to this blog..
Hope everyone is doing good!! Well the second ones dark so it’s hard to judge, but personally, I like the first one! Those particular vision effects are a good match for the hi-definition format used to broadcast SGU. You’re telling us the saint but not the miracle, AGAIN! I am very excited by reading this news too, THANK YOU for sharing!!! Shall watch the video clips later tonight, on the phone with my mum right now, and will read her the blog entry as soon as I get the chance to! Shall be submitting another blog to Wormholeriders.com tomorrow evening sometime, the link is http://wormholeriders.com/blog/?cat=3506 for anyone curious to see the campaigns going on in the wonderfully imaginative world of the fandom! By the way… Thank you for posting the Youtube videos. I can’t view Flash content so it was great to be able to view the videos on the mobile version of Youtube’s site. I like the second version better. Great that there’s still some hope. We’ll keep the campaigning up! Ooops, prepositions are not words with which sentences should be ended. I hope that SGU gets to finish its original story arc as I have become hooked. I have been a long time fan of the franchise (form the beginning) and I really hope that this isn’t the end. I had a question though. I apologize up front if this has been asked before. In SGU, where do they get the materials to repair parts of the ship (i.e. the dome room, shuttle, etc)? Is there a source of them on board? Thanks for the videos and for keeping us as “in the loop” as you can. I like both, but each has a very different feel. The first is much more urgent and violent. The second is more creepy and suspenseful. @das: I haven’t been visiting MM much lately so I appreciate the update. I hope all goes well with Mike’s surgery! How’s Cemetery Dance going? Joe, I like the rainbow effect too and also the watery feel for creature cam in the second video i think works especially with some weird sound effect as though shifts to its vision makes a sound. Im not sure about desaturating it, its alittle bit of a cliche now, its safe but I think there should be something different. A dynamic organic feel of some kind. Just watched the 2 clips, I’m guessing the first one was the original and the second was the desaturated version? If so, from my monitor anyway (and my poor lappy’s monitor’s seen better days) the first one did look neat, but a touch too bright, and the second one was pretty dark. If there were a good middle of the road, maybe about 35% to 45% less saturation on the first one, or 25% more colour getting through on the darker one, would work? Hope that helps with the decision! My fingers are crossed for SGU. I have really enjoyed the 2nd season. I see you are reading the Stand. I thought it was a great book and one of my favorite Stephen King novels (Running Man and It are my favorites). It does have a bit of a dull part early in the book, but it you stick with it, it’s a wonderful read. Thanks so much for sharing the positive developments on the Stargate front! I just finished up Joe Abercrombie’s First Law trilogy! Thanks so much for recommending it a while ago and I look forward to picking up The Heroes after this semester (thesis work comes first)! Hope all goes well for SGU. Are you feeling any better, Joe?? @ Sparrowhawk – I’m a bit worried for Mike. I know it could go either way with things like this and diabetes. He’s such a sweety, I just hope he sticks around for a little while yet. RE: Cemetary Dance – slow progress. I spent the last couple or three days catching up on a huge backlog of comics. All caught up now! Since I was reading the comics, however, I’m only up to chapter 9, I think. I did lol at the scene of D’Agosta and A.X.L. waiting for the elevator. That Pendergast and his Latin declensions! What a nerd! Thanks for sharing some positive news, and thanks also to Brad for working so hard to continue the SG franchise. Fingers crossed that we’ll see a 3rd season for SGU, and hopefully a third SG1 movie. I agree that the saturation is nice the way it is. Too often when those types of effects are desaturated, you end up with something that seems like a Predator knockoff etc., whereas leaving it more vibrant actually is a surprise, and subconsciously, it seems reasonable to consider that an alien lifeform might have vision that, to us, would be sorta like that. Any chance this article “Blind Item: Which Dead Drama Series is Suddenly Showing a Pulse?” over at http://www.tvline.com/2011/01/blind-item-dead-drama-showing-a-pulse/ Apply’s to stargate universe? Wonderful news! Your post was VERY uplifting !! Hoping for the best!